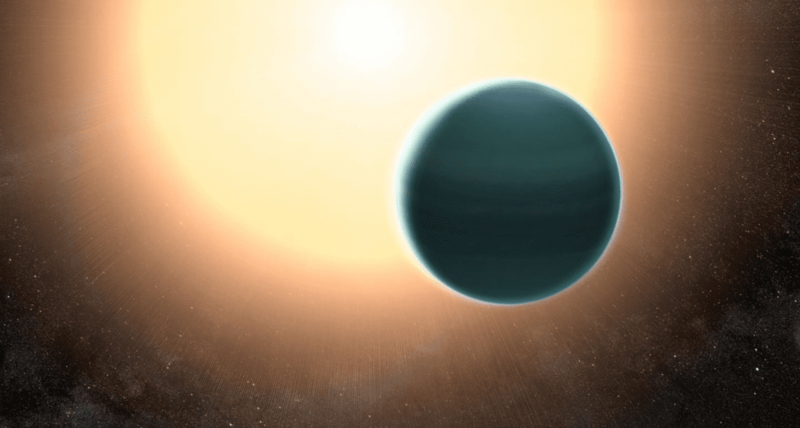 A new study led by NASA with contributions from the University of Maryland reveals that the distant planet HAT-P-26b has a primitive atmosphere composed almost entirely of hydrogen and helium. Located about 437 light years away from Earth, HAT-P-26b orbits a star roughly twice as old as the sun. The analysis is one of the most detailed studies to date of a “warm Neptune,” a planet that is Neptune-sized and orbits close to its star. The discovery of such a primordial atmosphere on this Neptune-sized planet has implications for how scientists think about the birth and development of planetary systems. Compared to Neptune and Uranus, the planets in our solar system with about the same mass, HAT-P-26b likely formed either closer to its host star or later in the development of its planetary system–or a combination of both. To study HAT-P-26b’s atmosphere, the researchers used data from transits– occasions when the planet passed in front of its host star. During a transit, a fraction of the starlight gets filtered through the planet’s atmosphere, which absorbs some wavelengths of light but not others. By looking at how the signatures of the starlight change as a result of this filtering, researchers can work backward to figure out the chemical composition of the atmosphere. Because the study provided a precise measurement of water, the researchers were able to use the water signature to estimate HAT-P-26b’s metallicity–an indication of how rich the planet is in all elements heavier than hydrogen and helium. Astronomers calculate metallicity to provide clues about how a planet formed. To compare planets by their metallicities, scientists use the sun as a point of reference–almost like describing how much caffeine a beverage has by comparing it to a cup of coffee. Jupiter has a metallicity about 2 to 5 times that of the sun. For Saturn, it’s about 10 times as much as the sun. These relatively low values mean that the two gas giants are made almost entirely of hydrogen and helium.